Korzus were founded back in 1983 in São Paulo which released several albums through the years. 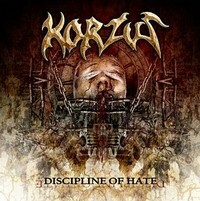 Now their 7th album - Discipline Of Hate - will hit the stores. The Paulistanos are playing technically on a high level and offer some variety in their songs which makes the album very enjoyable. And intro leads you into the title track Discipline Of Hate, a heavy, riff-based thrasher. The quintet shows parallels to Sepultura and Soulfly, but as they are from Brazil it's probably in their blood. With a short TV / radio announcement - it's in Portuguese - they kick off 2012, but then storm off! A mean neckbreaker! For Raise Your Soul they slow down a bit, but the track is heavy and offers fast double bass drumming. More fast thrashers follow and sometimes they surprise the listener... Check out Never Die! Or give Slavery a try! This one might not surprise you, but it's a good example for Korzus' sound. At You Reap What You Sow the guitarists once more show their talent, it's one is a heavy, riff-based rocker with tempi changes. With the fast Hell they close this chapter. Hopefully Korzus will get some attention outside Brazil... Like their fellow countrymen Torture Squad the band offers high class thrash metal, so check them out!